GCU has received a valuable addition to its archives, with the donation of the Social Enterprise Collection (Scotland) by John Pearce, one of the UK’s founding figures in social enterprise, following his retirement. The papers and documents on Community Development, Community Enterprise, Social Enterprise and Social Accounting and Audit were accumulated over the course of John’s 35 year career. 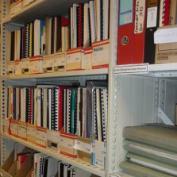 They are joined by the Community Business Scotland archive of papers and reports from 1981 onwards. John Pearce played a pivotal role at the heart of Scotland’s community and social enterprise movements, and his work has had a global impact. Click here for more information about the Collection. The Social Enterprise Collection (Scotland) builds on GCU’s ongoing commitment to social enterprise, through Scotland’s first MSc in Social Enterprise, developed with the Social Enterprise Academy. This is a result of GCU’s recognition that social enterprises are a growing sector of profitable businesses, and agents for positive change defined by their social and environmental missions. For more information about how we work with Social Enterprises and the third sector, click here. Interesting article on The Guardian’s Social Enterprise Network website. Kenny MacAskill, Justice Secretary and SNP parliamentary candidate for Edinburgh Eastern, pledged his support for social enterprises in Scotland at the opening of the annual Social Enterprise Fair, S2S. The SNP candidate signed up to the new Social Enterprise Charter, showing his support for the continued growth of this vibrant sector in Scottish society. Glasgow Caledonian University (GCU) has developed the only MSc in Social Enterprise in Scotland, run in partnership with the Social Enterprise Academy. Find out more about the PgC and MSc Social Enterprise programmes. A partnership between GCU, Applegreen Homes and Spacesix Architects has created the affordable, energy efficient house of the future. The new house will feature a solar-energy package that will help to reduce electricity and heating bills, aiming to eradicate fuel poverty. Prices start at only £49,999 for a three-bedroom home. The unique Applegreen Homes concept was designed by Glasgow firm Spacesix Architects with assistance from GCU, who researched and developed all aspects of the build, ensuring it is highly energy efficient yet affordable. The showhouse is now on display in the prestigious BRE Innovation Park, based at the former Ravenscraig steelworks site in Motherwell.